Ron Rheam, 64, who identified himself as "in between housing" shopped at the new 14,600-square-foot Goodwill store Sept. 17 in Fayetteville, Ark. Rheam is a frequent Goodwill customer, but thinks the store may be overpriced. "They keep going up on their prices," Rheam said. "But if you're really in need of things [Goodwill] is the way to go. Especially if you don't have any money to start with." "Clothes come pretty low on the totem pole when you've only got so many dollars to spread around and you're trying to eat," Rheam said. Goodwill provides low-priced goods and has added more than 300 jobs to the Arkansas economy in the past three years. University of Arkansas senior, Alexis Caldera, "always find a good deal at Goodwill," she said. 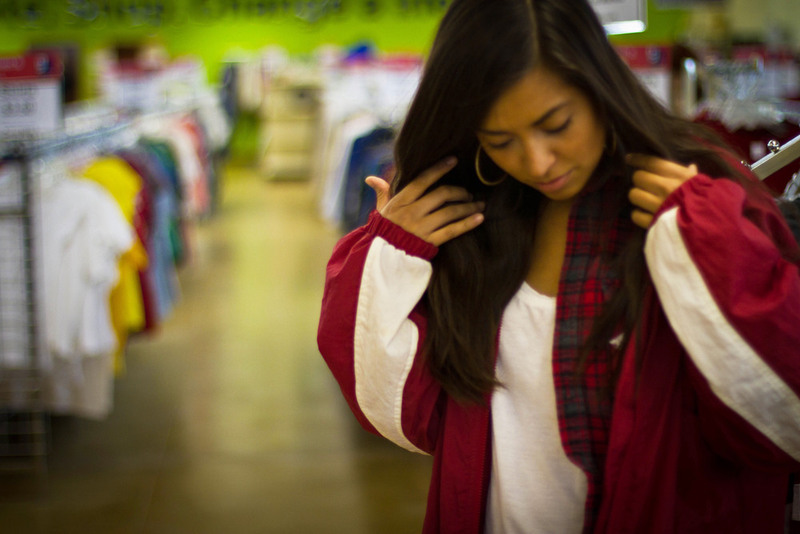 Shopping at thrift stores has become popular, as students have taken up “thrifting,” drawing from the popularity of websites and television reality shows. Goodwill has continued to grow amid the struggling economy. The Fayetteville store is the sixth in northwest Arkansas and has become the 31st in the state. Although shopping at thrift stores for fashion instead of need has become popular among many students, Goodwill does not plan to raise prices, store manager Kathy Magner said. They will continue to serve the community with low-priced goods. I shop at Goodwill because I’m into fashion and making old things into something cool,” said interior design major, Alexis Caldera. “It seems to be the trend." Alexis Caldera (left) and Derrick Nichols (right) were excited for a Goodwill store to open close to campus. The pair often shops at thrift stores for vintage-inspired pieces. This year, Goodwill served people through employment and training programs, added jobs and opened new stores as “thrifting” was made popular by celebrities and websites. The organization has continued to expand in northwest Arkansas because people are benefiting from the career services, donation services and retail stores Goodwill provides, President and CEO Brian Itzkowitz, said in a Sept. 13 press release. “Both the donation and retail side of the business has been really good and we have career service centers in Springdale and at both Fayetteville locations,” Goodwill spokeswoman Rebecca Brockman said. Thursday was the grand opening of a 14,600-square-foot Goodwill store, donation center and career services center at the former Aldi’s supermarket next to Fiesta Square in Fayetteville, just a few miles from the UA campus. “The grand opening this weekend was amazing; a great success,” said Kathy Magner, Goodwill store manager at the new location. 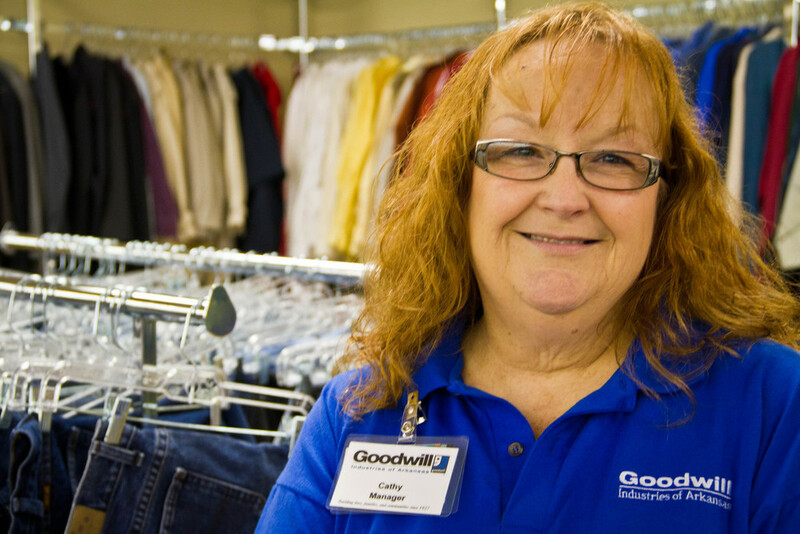 Goodwill has continued to grow amid the struggling economy. The Fayetteville store is the sixth in northwest Arkansas and has become the 31st in the state, according to the press release. With the Fayetteville addition, Goodwill has added more than 120 jobs in three years to the northwest Arkansas economy and more than 350 jobs statewide, Brockman said. For some UA students, shopping at Goodwill is less about the money and more about the trend. Fashion, convenience and price are factors that encourage students to shop at thrift stores like Goodwill. “I shop at Goodwill because I’m into fashion and making old things into something cool,” said interior design major, Alexis Caldera. “It seems to be the trend. “Students are shopping there for fashion, but if you’re broke you can get the same cute stuff that you would get at the mall for a lot cheaper. That’s why I like it,” Caldera said. Although shopping at thrift stores for fashion instead of need has become popular among many students, Goodwill does not plan to raise prices, Magner said. They will continue to serve the community with low-priced goods to benefit those who cannot afford to shop elsewhere. Some don’t agree that Goodwill hasn’t increased prices. “Some of the prices are pretty standard for thrift stores, but it seems like more students are wanting the same things and I’ve seen an increase in prices,” she added. Goodwill is not just a store, but also a training center with specialists who work with people to understand their strengths and build a career, according to their website. The job center located inside the Fayetteville store is the third center in northwest Arkansas. Because of the tough economy, Goodwill has seen a surge in the use of the job training and career counseling services. “In addition to providing a great place to shop, we’re trying to help people find jobs because we understand that to be successful you need employment,” Brockman said. In the last fiscal year 2,480 people sought services from the career centers in Fayetteville and Springdale. 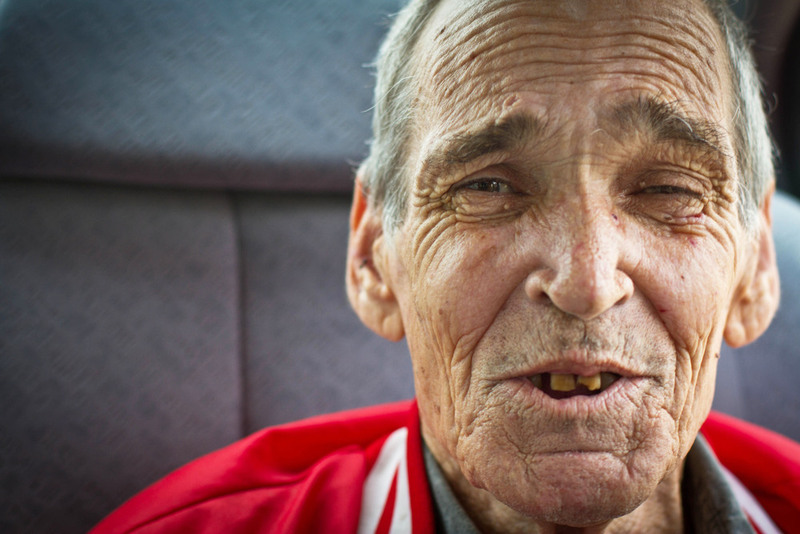 Compared to last year there has been a 285 percent increase in the people served in northwest Arkansas. “We help build lives, families and communities by assisting people with other special needs through our stores and job training,” Brockman said. Internationally, 4.2 million people have been served through Goodwill’s employment and training programs and they’ve helped 189,000 earn jobs, according to their website http://www.goodwill.org/about-us/our-mission/.